Assassin's Creed IV: Black Flag is lacking some multiplayer gametypes that were popular in previous games - and according to the designer, those modes can't come back. It seems like the only multiplayer these days is either free-for-all or team deathmatch between two sides. Every so often, though, there's a fight with three or more sides, which opens up a whole new way of handling the battlefield. 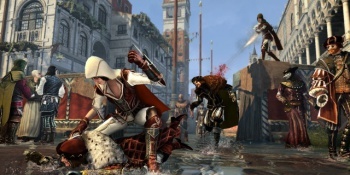 One such mode was the Alliance gametype in Assassin's Creed: Brotherhood, which split players into three teams of two. However, according to the lead multiplayer designer of Assassin's Creed IV, that kind of multi-team approach isn't coming back in Black Flag due to the way the game's multiplayer is built. A Q&A on Ubisoft's blog had one player asking if the Alliance gametype might be making a return. "We'll look into the potential of adding more parameters," responded Ubisoft's Tim Browne. "Alliance, however, can't return. The reason Alliance can't come back is that it uses 3 teams of 2 players. None of the game systems support 3 teams any longer." It doesn't get much clearer than that. Three teams is something that Black Flag doesn't support on a technical level, and though Browne didn't elaborate on why exactly it wasn't possible, he sure sounded pretty adamant on the topic. So no more Alliance, and no more modes with more than two teams. It's a shame, since Assassin's Creed's new Game Lab allows players to tweak various settings to create customized game types - those are the parameters Browne mentioned. Players have been coming up with some clever modes, but that restriction probably limits a lot of ideas. At this point, our best bet may be to hope Ubisoft redesigns its systems to include that possibility in the next Assassin's Creed game.